Today is my birthday! For some reason this year I am way more excited about it than in years past. I am 23 today, and I obviously had to do some nails to celebrate the occasion! I decided to do a confetti pattern. I sort of made this up as I was going along! 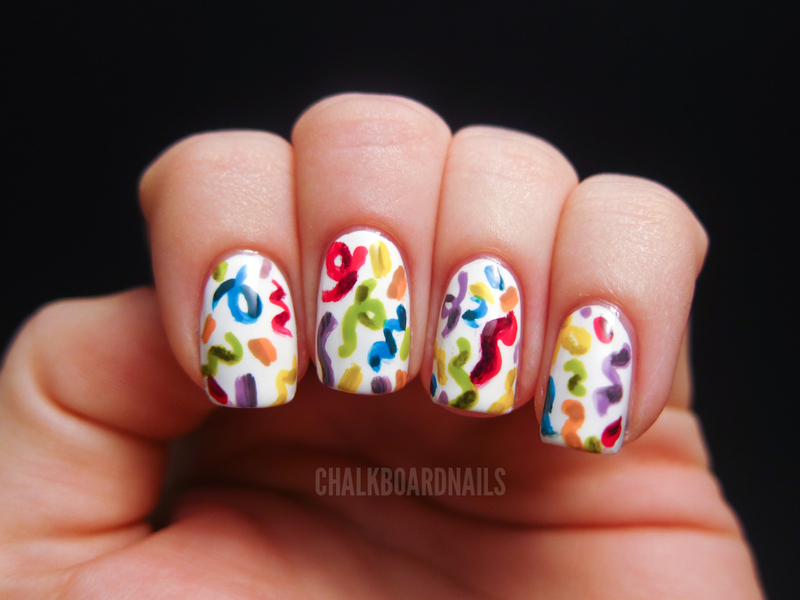 I tried to channel my inner Michelle (Sonoma Nail Art) and add some shading to the ribbons and confetti pieces. I think it was (mostly) successful! Colors are listed below, but FYI: on the shading, I just took the base colors and mixed in a tiny bit of black. This was obviously painted freehand and I just used my favorite little nail art brush. I haven't done intricate nail art like this in a while so I was very excited to see the finished result! Well, first of all Happy Birthday! This looks amazing!! I like the use of shadows to create a realistic look! Happy birthday!! I love it! HAPPY BIRTHDAY!!!!! I hope you have an awesome one!!! this mani is awesome. You did an awesome job with the shading it looks sooo good. Happy Birthday!! These look awesome! Happy birthday!!!! have a great day! That is a super cute mani!! Happy Birthday!!! I love this mani! Happy Birthday! This looks awesome! I'm turning 23 this month too! I like the confetti! Very cute look. Happy Birthday! 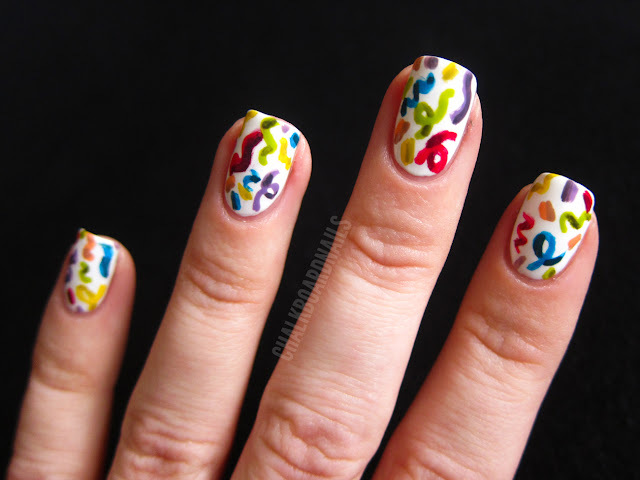 Your confetti nails are super cute! Happy Birthday from me as well Sarah! I love this manicure! Happy Birthday! I love the design! Happy happy birthday to you and your perfectly manicured nails :D hope you have an awesome day! Woot, happy birthday! If you're in the Valley, you should totally go to Four Peaks for a birthday dinner and beer - my favorite bar!! These are sooooo good! And I am doubly impressed because you used nail polish. I use acrylic paint and it is a lot easier to control than nail polish, so this is super awesome! Have a wonderful bday Sarah! HUGS! Happy Birthday Sarah! The nails are awesome! 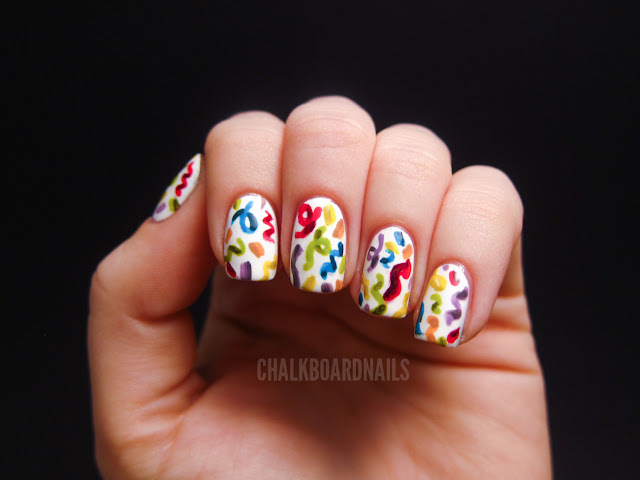 this mani looks so cheerful and fun! Happy birthday! These reminds me of the Disneyland Street Party Parade! Happy Birthday! These are such happy, fun nails! happy birthday darlin!! Love the mani! happy happy birthday!! I love the shading you did on these! This is great!I love the design!HAPPY BIRTHDAY! happy birthday!!! hope you don't mind but i'm totally stealing this awesome mani! great job!!! happy birthday! i hope you had a great day! the manicure looks awesome! Happy birthday Sarah, another Sag sister! :) There are a few of us nail polish bloggers who are Sagittarius. What a cute and festive birthday design! Hope you had a wonderful day. Happy birthday! My birthday is coming up. I should do a birthday design like yours but I am too lazy. WISH YOU A HAPPPPY YEAR! Happy birthday! I remember being 23! Love your mani! So cool! Happy Birthday! Wish you tons of joy and happiness. Love your nails. Please do visit my blog :D. Just uploaded Winter penguin nails. Happy birthday!! Your nails look gorgeous! Definitely my favorite of any of your previous designs. LOVE! Wow, that shading is pretty amazing!